Government protests in Iran might have calmed, but the two-week movement continues to draw international attention, as new reports reveal that protestors are being tortured and possibly even killed while in custody. And, many of those Iranians in custody are being held without charges against them. 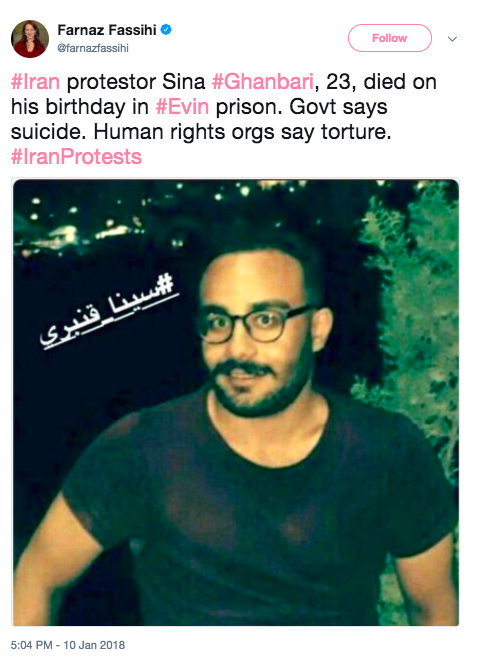 One Iranian spoke to Fox News from outside Evin Prison in northern Tehran and said that people in custody are being tortured – “maybe tortured to death.” The Iranian is a 31-year-old activist and business owner whom Fox said declined to give his last name out of fear. “People are very concerned about the health of the arrested people. Mothers are there and they don’t know anything about their child’s situation, or even if they are alive,” another protestor told Fox. Protests began late last year, on Dec. 28, in Iran’s second largest city and one of Iran’s holiest places, Mashhad, due to the country’s high inflation, economic policies and economic inequality, and unemployment. The protests have spread to more cities and the message has turned more toward regime change. The White House Press Secretary released a statement on Wednesday calling for the immediate release of all protestors, following reports of torture and death. The Trump Administration is deeply concerned by reports that the Iranian regime has imprisoned thousands of ‎Iranian citizens in the past week for engaging in peaceful protests. Further reports that the regime has tortured or killed some of these demonstrators while in detention are even more disturbing. We will not remain silent as the Iranian dictatorship represses the basic rights of its citizens and will hold Iran’s leaders accountable for any violations. 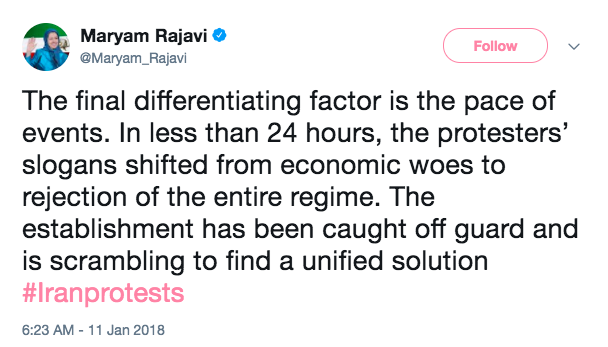 The protesters in Iran are expressing legitimate grievances, including demanding an end to their government’s oppression, corruption, and waste of national resources on military adventurism. Iran’s regime claims to support democracy, but when its own people express their aspirations for better lives and an end to injustice, it once again shows its true brutal nature. ‎The United States calls for the immediate release of all political prisoners in Iran, including the victims of the most recent crackdown. At this point, more than 3,000 people have been detained as the protests have spread all across the country. Many Iranians in custody are being detained without charges. It is believed that at least 21 people have died because of the protests. It was reported two detainees apparently took their own lives – including 23-year-old Sina Qanbari, but Iranians aren’t buying that story, Fox reported. It became challenging to find protestors’ firsthand accounts of what’s happening in Iran, as the government cut off some of the internet to its people shortly after the protests began, including the most popular communication app in the country, Telegram, and others such as Instagram. It is estimated that half the country uses the messaging app Telegram. Iranian President Hassan Rouhani has recognized the people’s right to peacefully protest but warned that security forces would not tolerate vandalism and chaos. And, the grave penalty for speaking out against the Iranian government is death, if convicted. President Donald Trump and the White House have come out in support of the protestors, and they have criticized the Iranian government for sponsoring terrorist groups around the Middle East. Trump also warned that he and the United States are watching for human rights violations, and that the U.S. could impose sanctions if such violations occur. “The Iranian dictatorship […] remains the world’s leading state sponsor of terrorism,” the President has said, saying the regime provides assistance to al-Qaida, the Taliban, Hezbollah, Hamas and other terrorists.